We often get requests for products to be used in software other than PowerPoint. To help you use 24point0’s illustrations and diagrams across documentation software, we’ve prepared the guide below to using our products in Microsoft Word. 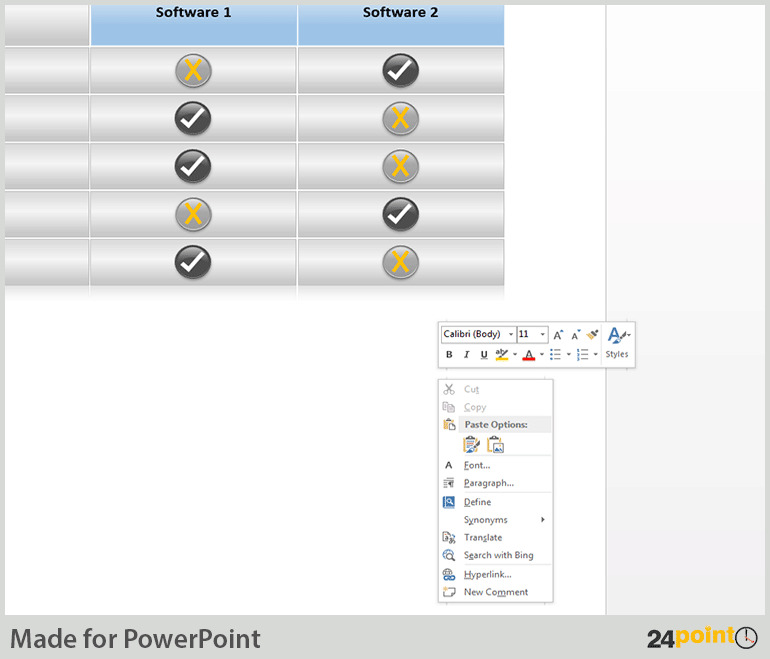 Can I use 24point0’s PPT products in Word documents? Yes, you most definitely can. All of 24point0’s diagrams and illustrations can be adapted for use in Microsoft Word documents. Are these diagrams and illustrations editable? These diagrams are easily editable and since they are available from 24point0 in PPT format, you can edit them using PowerPoint. You can change colors, fonts, decrease the number of rows and so on. How do I insert a PowerPoint slide or image into a Word document? After you’ve edited the diagrams with respect to colors, fonts, number of cells or rows, select the whole illustration and copy and paste them into the relevant place in the Word document. When you paste the PowerPoint Diagram in the document, a little clipboard will appear in the lower right hand corner of the picture. Click on the dropdown and be sure to select the Keep Source Formatting option. 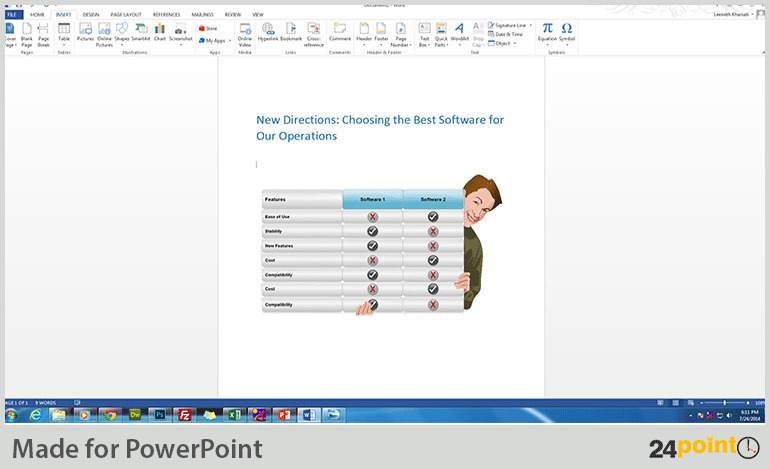 This will ensure that the colors and fonts you chose for the original PowerPoint Diagram are retained in the Word doc. Can I use them only in PowerPoint? What kind of docs would I use these in, you ask. Well, If you need to get away from the same old representation of graphs or charts, simply use one of our more innovative business tools such as the Comparison Table. This is a particularly smart and compact tool if you’re writing a white paper or a proposal for a new software your organization should buy. Read 24point0’s guide to using editable graphics in Outlook to create eye-catching mailers. Can I combine two or more diagrams? Of course! At 24point0 we believe that more can sometimes be never enough, especially when it comes to effectively communicating business concepts. 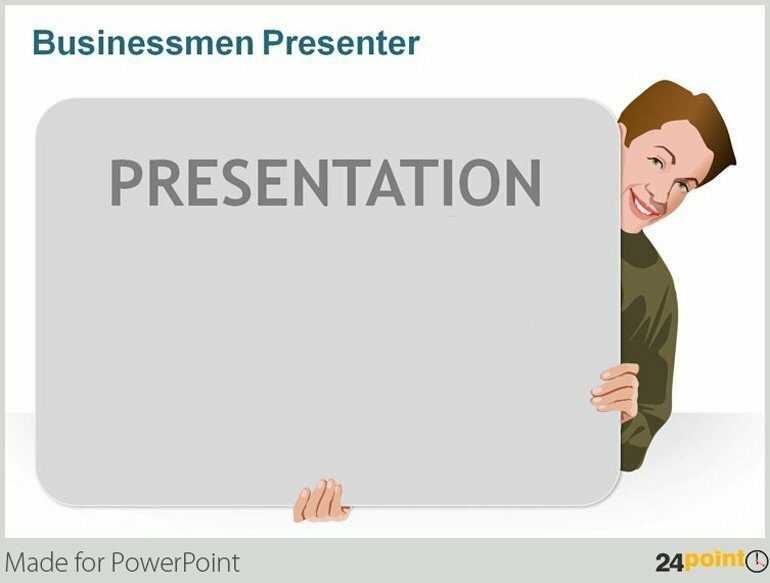 For example, If you need to amp up the expressiveness of the aforementioned comparison table, then just combine it with a figure from the Editable Businessmen Presenter series. 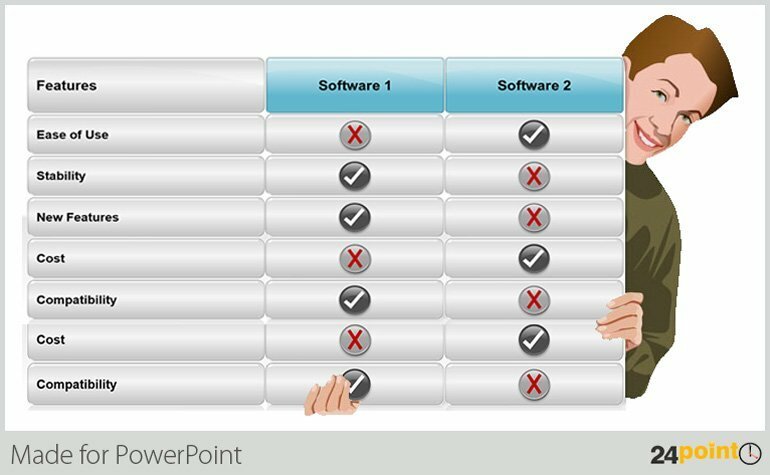 How do I combine the two PowerPoint diagrams? 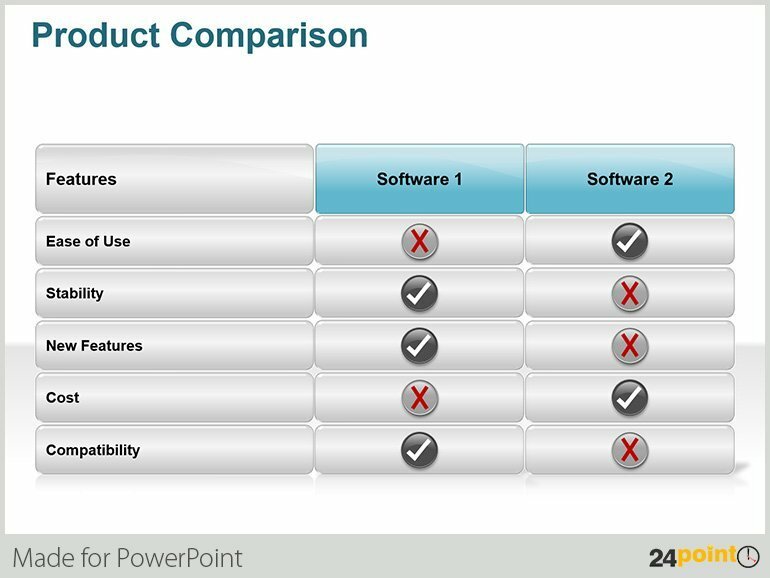 Ungroup and select the figure of the man and paste it in the same slide as the Comparison Table. Adjust the hands and head to ensure they are aligned to the sides of the table. You can even scale down the table to suit the slide layout. And voila! You have a whole new look for even the most jaded data table. Group the two images together and paste them into the Word document, ensuring that you select the Keep Source Formatting option. Now you have a document that really means business!